Vintage - Paragon China Co. "Fragrance Pattern #PARFRAGR", Bone China (Pink Rosebud) - Made from 1957 through 1960 Only - (20) Pieces. 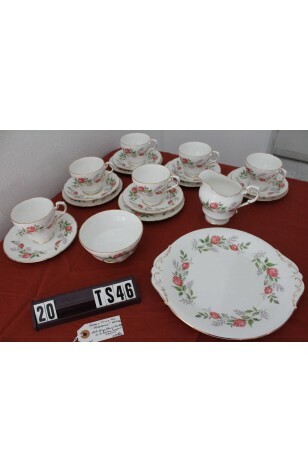 This nice Set is one of the "Fragrance - PARFAGR" Patterns by Paragon China Produced for only four Years from 1957 through 1960 Only. A White Background with a Wreath of Pink Rosebuds, and Green/Gray Foliage. All Items are slightly Scalloped, and Rimmed in 22kt Gold, as well as 22kt Gold Handles and Foot of Cups, Creamer and Sugar Bowl. A really romantic Pattern for the "Bridal Showers", or even as a "Tea for Two". 5 - Saucers - 5 7/8"
6 - Bread/Dessert/Tea Plates - 6 1/2"